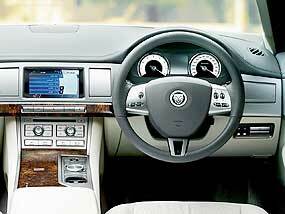 According to the latest international news, Jaguar Land Rover will be another Indian Tata company in June. This is a month ahead of schedule. The $2.5 billion sale of the two British icons to the Indian manufacturer was to be finalized at the start of the new financial year, but Jaguar Land Rover have said it would now be June 1. The future of Jaguar now hinges on the acceptance of the new Jaguar XF, which has been receiving very good reviews in the overseas motoring press. 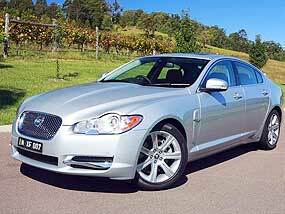 For my money, it looks a little too like the Lexus IS 250, but the XF apparently has a host of gimmicks, such as before you even start the engine the Jaguar XF wants you to know it’s ready for business. A red light in the Start/Stop button gently pulsates, simulating a heartbeat. Then the gear selector knob gently rises to its driving position. Great to show the mates down the pub, but in that section of the market, you need a bit more than gimmicks. The XF range is comprehensive with a V6 diesel (152 kW), V6 petrol (175 kW) and two petrol V8’s with the top of the range being supercharged (219 kW and 316 kW). A standard seven-inch color touch-screen operates most vehicle functions, leaving the real wood-trimmed dash uncluttered. Another new system dubbed JaguarSense enables the glovebox to be opened and overhead lights switched on or off at the touch of a sensor. As well as the full quota of driver and passenger safety equipment, the XF is the first Jaguar saloon to feature the company’s pedestrian impact system (PCSS), which reduces the likelihood of injury by firing actuators that angle the bonnet to provide a cushioned space between the bonnet and the engine. Remember too, that the leaping jaguar bonnet mascot was killed off by the safety wallahs many years ago. Standard equipment across the range also includes twin front, front side and side curtain airbags, electronic stability control, plus the usual alphabet soup of ABS with EBD, EBA and cornering brake control, an electric parking brake, LED tail-lights, heated power mirrors, power windows, auto headlights, rain-sensing wipers, remote central locking and rear parking sensors. Also standard is satellite-navigation, Bluetooth connectivity, dual-zone climate-control, cruise control with speed-limiter, keyless starting, power front seat and steering wheel adjustment, driver’s seat memory, an eight-speaker 140-Watt sound system with six-CD changer and “Bond Grain” leather-faced seats, dash and door trims. All this is included in the basic Luxury grade for 2.7D and 3.0 V6 variants, which ride on 18 x 8.5-inch alloy wheels. Moving up a trim level, the 4.2 V8’s Premium Luxury specification adds metallic paint, folding and auto-dimming wing mirrors with puddle lights, 19-inch alloys, a rear parking camera, Soft grain leather trim, Burr Walnut veneer, keyless entry, a 320-Watt sound system and bi-Xenon headlights with cornering lamps, washers and auto-leveling. Finally, the SV8 adds the active suspension system from the XK, a ‘Dynamic’ mode that disables the stability control, tyre-pressure monitors, massive 20 x 8.5-inch front and 20 x 9.5-inch rear alloys, heated/cooled front seats with 16/12-way power adjustment, Rich Oak veneer, a 440-Watt Bowers & Wilkins surround-sound system, voice recognition system and a TV tuner. Options include a sunroof, steering wheel heating, adaptive cruise control, electric rear window blind, and a blind-spot monitor, as seen on Volvo’s flagship S80. Of course, the question mark still hangs over the upholstery. Will the new (Indian) Jaguars continue to have cow hide, or will it be pig-skin from now on? Last week I noted that the Mercedes-Benz 300 SL, the Chevrolet Corvette of 1957 and the Triumph TR 5 all had something in common as a first in their home countries. What was it? It was just that they were the first fuel-injected mass market motor cars in Germany 1954, USA 1957 and the UK in 1967. So to this week. We mentioned Jaguar and its new XF. 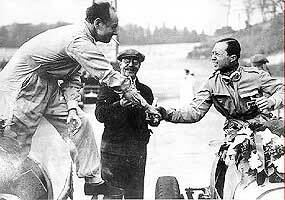 Think back to when Jaguar was winning Le Mans, three times in a row, with the first two times being factory entered racers and the third victory was from a privately entered Jaguar. After Jaguar officially withdrew from racing, the factory had some racers left over. The question this week is, what did they do with them? An article I wrote some time ago about one of Prince Bira’s ERA’s has prompted Michael Doland in the UK to contact me, via Martin Kent in Jomtien. Martin wanted Michael to expand on the White Mouse Stable cars, which he has done. “Hanuman (chassis R12C) was renamed Hanuman 2 by reason of having been rebuilt with bits from other ERAs following (Prince) Bira’s very hairy crash at Rheims only months after (Prince) Chula (Prince Bira’s cousin, Prince Chula Chakrabongse, who’s team was White Mouse Racing) took delivery of it in 1938 from Bourne, the ERA place in Lincolnshire. Most of the important bits were donated by R8C, which had been comprehensively wrecked by Earl Howe in 1938; other items were scrounged from Bourne or made available by other ERA owners, or retained by past owners. R12C was the first of the (Prince) Chula cars to become blue and yellow, “gracious permission” having been given by HM the King for White Mouse to use the Royal racing ‘Silks’. “Romulus, R2B, was (Prince) Chula’s 21st birthday gift to (Prince) Bira in 1935. Remus, R5B, joined the stable in 1936. “While all three cars are now blue and yellow, in their beginnings the first two were hyacinth blue all over applied with an eggshell finish. The choice was made at the birthday party, when (Prince) Bira noticed a pretty girl’s evening dress and said that its color would be just right for the car. (Prince) Chula took a cutting from the dress’ hem and had cellulose mixed to match. “Romulus and Remus were fielded everywhere in 1936 and 1937. In the latter year (Prince) Bira started to drive the ex-Whitney Straight 2.9-litre Maserati; when I last heard of it, it was black, I think, and owned by a US gent. “Upon choosing Hanuman, Remus was sent to ERA’s for Tony Rolt to use, but whether (Prince) Chula traded it in or sold it directly to Rolt I don’t know. “In pre-War days I think Romulus was the most successful car; post-War, Remus was the one most often seen, raced very vigorously by the late Pat Lindsay, chief auctioneer at Christies. It is still in the hands of the Lindsay family and is expected to appear again this year driven by Pat’s son, Ludovic. “Romulus is the one that spent the War in Cornwall. Princess Narisa, without any warning, recently sold him to a very rich Microsoft executive who owns a lot of good cars and is said to be a great anglophile. Having regard to the car’s long inactive periods and, therefore, being in doubtful condition, English experts have been commissioned to completely rebuild it; it is to take to the tracks later this year.